In a series of activities worthy of the satire stage at Second City Comedy Theater, the administration of Chicago's public schools have responded to the unprecedented organization of parents, students, teachers and other citizens against the regime of high-stakes testing by trying an almost comic opera series of attempts to ignore and suppress the First Amendment rights of teachers, parents, students, and the media themselves. "Chicago Public Schools chief Barbara Byrd Bennett has threatened to discipline any teacher who refuses to administer an annual state achievement test next week, according to a letter obtained by the Chicago Sun-Times. 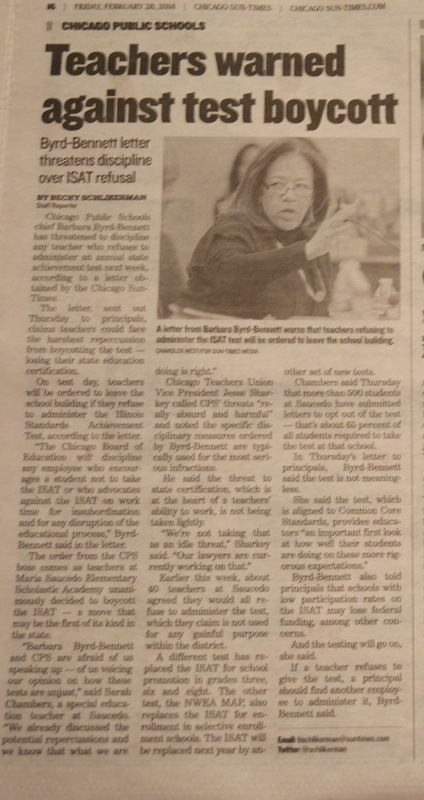 The Byrd Bennett letter was noted with irony by principals and others who read it, given that Byrd Bennett herself doesn't hold an Illinois administrative credential earned in the usual manner (she was imported from Detroit by Mayor Rahm Emanuel after his first out-of-town CEO blew it with the Chicago Teachers Strike of 2012), and the fact that the administration of Board President David Vitale has apparently entered into a secret agreement that allows Byrd Bennett to continue to hold her permanent residence in Solon, Ohio (a violation of Chicago's residency rules, which are strictly enforced against teachers and other lower ranks) and pays to have her fly First Class to Ohio whenever she wants to return "home." As we head into ISAT administration next week, we want to make sure all staff members are clear on the requirements around this test and the repercussions for not administering it. We also want to clear up misinformation that is circulating in the district. The time spent on the ISAT is less than 1% of the entire school year. The test DOES NOT take up the entire 2-week window as some would claim. It takes about 3 hours each for reading and math, and 2 hours for science in only grades 4 and 7. (See here and here�page 6, and here��ISAT Summary� for more details). The 2-week window allows for maximum flexibility in scheduling at the school level, and for make-up testing of students who were absent. Make-ups do not interrupt the instructional time of other students as they are conducted in a separate room. ISAT is not a drain on the CPS budget because CPS pays nothing for it. Although ISAT will not be used for accountability, selective enrollment or student promotion, it is not meaningless. It will be completely aligned to the Common Core standards in both the range of skills assessed and the depth of student-response expectations in writing. This will provide educators an important first look at how well their students are doing on these more rigorous expectations. Other current assessments do not offer this depth of information. Federal and State law require all students to be assessed in grades 3 - 8. Schools with low testing participation are in jeopardy of losing federal funding as this test is a required component of NCLB. ISBE may review the accreditation of schools with low testing percentages. Low percentage participation will also affect AYP status. If an individual teacher refuses to administer the test, you should direct that teacher to swipe out and leave the work place. You should direct another employee to administer the test. The State Certification Board may take action to revoke the certification of any employee who encourages a student to boycott the ISAT. The Chicago Board of Education will discipline any employee who encourages a student not to take the ISAT or who advocates against the ISAT on work time for insubordination and for any disruption of the educational process. If parents or students make unsolicited inquiries regarding testing or opting out, staff shall explain that the ISAT is required by state and federal law and Board policy, and shall refer the questioner to school administrators to address any further inquiry or request. It is critical that all parents, students and staff understand these potential repercussions. While employees may voice their opinions on matters of public concern, they have an obligation as government employees not to undermine or interfere with state and federal law and with Illinois/CPS Testing policies by encouraging students to opt out. Please direct any additional questions about testing policy to Didi Swartz (773-553-1161 or cmswartz@cps.edu). Please direct questions on potential repercussions to Tom Krieger (773-553-1193 or tkrieger@cps.edu) or David Ruhland (773-553-2321 or druhland@cps.edu).